A big Martian sand dune looks blue in this enhanced-color photo, which was taken on Jan. 24, 2018, by NASA's Mars Reconnaissance Orbiter. The dune is actually gray but stands out because it differs from its surroundings in composition and/or grain size. A big sand dune blazes in an electric blue on the Red Planet in a gorgeous photo by NASA's Mars Reconnaissance Orbiter (MRO). The large, complex dune is embedded within a field of classic, crescent-shaped dunes on the floor of the 147-mile-wide (236 kilometers) Lyot Crater, which lies about 50 degrees north of the Martian equator. 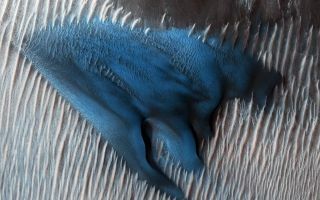 Before you get too excited about the exotic geological possibilities on alien worlds: As that reference to "enhanced color" suggests, the dune isn't actually blue. HiRISE photos "are given min-max stretches in each individual color image to increase contrast," HiRISE principal investigator Alfred McEwen, a planetary geologist at the University of Arizona, told the website Inverse. "The dunes are actually gray, but appear relatively blue after such a stretch, because most of Mars is red." The $720 million MRO mission arrived in orbit around the Red Planet in March 2006. Since then, the spacecraft has performed a variety of work, from hunting for signs of past water activity to scouting out landing sites for future rover missions. The orbiter also relays data from NASA Mars surface craft, such as the rovers Opportunity and Curiosity, back to Earth. HiRISE is an incredibly sharp-eyed instrument. The camera can resolve features as small as a coffee table on the Martian surface from MRO's near-polar orbit, whose altitude has ranged over the years from 155 miles to 196 miles (250 to 316 km).